Do you need a stroller at Disney? Even for a big kid? If you have young kids, of course you’re planning to use a stroller at Disney. But, even if your child no longer uses a stroller at home, you may want to consider using one at Disney. Nearing the end of the day, it’s guaranteed your child is going to be exhausted. And you will be, too. Faced with the option of carrying a 6 or 7-year-old or pushing a stroller all day, we prefer the latter. 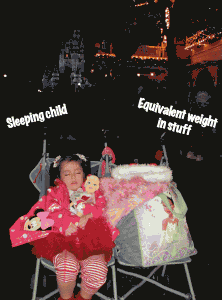 In fact, we had already sold our daughter’s stroller long before our first trip to Disney, at which time she was 4. Therefore, we decided to buy one for our first Disney trip, and even decided to make it a double, though we only have one child. The extra seat is for our “luggage” including Epi-Pen bag, a bag of wipes and allergen-free snacks, and souvenirs. We found a great umbrella double stroller, new on eBay for $30 or $40. We chose to buy one and haul it down for two reasons. The first was purely economic – we paid $30-40 for a new one vs. $30 a day rental for the same thing. However, the most important reason was our daughter’s food allergy. With a rented stroller, you can’t guarantee the cleanliness. Disney cleans them every day, but we would also have to do our own daily detailing. 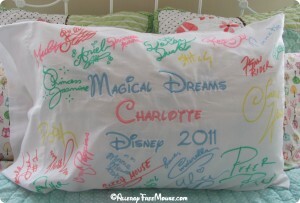 Additionally, some rentals disappear, at which time Disney will supply you with another at no additional cost. But then you get to detail another stroller. If you have to fly to Disney, you might need to factor in the cost of paying to check your stroller as luggage. Another option is to ship it ahead of time. However, the value of having your own, clean stroller is knowing your child isn’t going to run across that one food allergen left by another kid, that both you and Disney failed to find. Plus, you don’t have to carry your 45 lb. child, plus “luggage” out of the park at night. Does your little one like to dress as one of the Disney characters while visiting the park? If so, keep in mind that a lot of the costumes aren’t easy, or maybe impossible, to wash. And, after a day at the Magic Kingdom, your little one has probably come into contact with milk, peanuts or some other food allergen. If your child in sensitive enough to food allergens to cause hives, or worse, on contact, you will need to clean it thoroughly. Therefore, it’s important to get a costume that is machine washable. Chances are, if you’re visiting Disney for several days, they may want to wear it more than once. Also, the machine-washable costumes are more durable and stand-up better to a day (or more) at Disney, plus they’re much softer and not the least bit itchy. The dress in these pictures is about to take its third trip to Disney. And we just bought this one [EDIT: no longer in business 🙁 ] for the next trip, too. 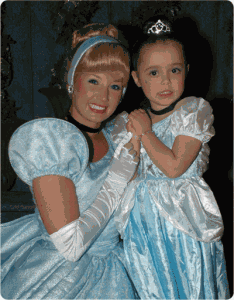 If you’re planning to visit the Bibbidi Bobbidi Boutique and get the full treatment, you will end up shelling out a ton of money for the hair, costume and accessories, just to have your little Princess begging to take off the costume an hour after leaving. So having a quality costume, that is comfortable and machine washable, is something you might want to consider. If you haven’t taken your Princess to the Bibbidi Bobbidi Boutique, try to budget it in. The experience is something she will never forget. And it’s excellent to do this just before a Character Dining event like Cinderella’s Royal Table. I made yummy gorp for Charlotte’s class. Each one includes Enjoy Life chocolate chips, bunny marshmallows, Newman’s Own organic raisins, Natures Path organic Whole O’s and Snyder’s of Hanover gluten-free pretzel sticks. 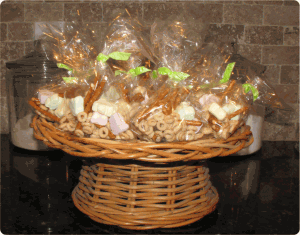 While gorp typically refers to “good old raisins and peanuts” we’re going with good old raisins and pretzels! Our primary goal was to make this dairy free, but it’s also gluten-free with these ingredients. 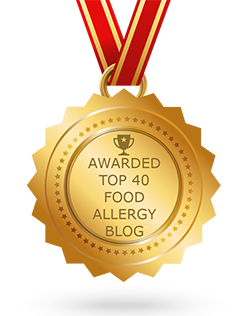 Contact problems with your food allergy? If your especially sensitive to some foods, so much that even contact with the allergen can create a health issue, here are a few tips. For girls, wear capri pants instead of shorts. They help to stay cool, but avoid allergen contaminants on chairs and rides. For boys, you may want to take a blanket or jacket to sit on. If you’re allergic to dairy, be especially careful during warmer months when ice cream is most likely to be in every other child’s hands. If you’re allergic to peanuts, be aware that animal handlers at the Animal Kingdom may use peanuts as treats and, therefore, have peanut residue on their clothes and hands. Keep baby wipes handy so that you can always wipe down seats and tables in restaurants. While Disney restaurants may be some of the cleanest in the country, sometimes seats are wiped after a table that may have had milk, cheese or peanut ingredients, leaving invisible traces of food behind. Skip the Crocs and sandals. They’re cool, comfortable and convenient, but when you’re around that many other kids, there is bound to be food on the ground or in other places you might not otherwise expect it. 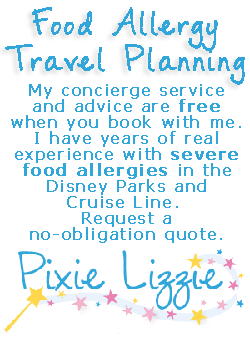 Be careful when meeting and hugging Disney Characters at Character Dining events.